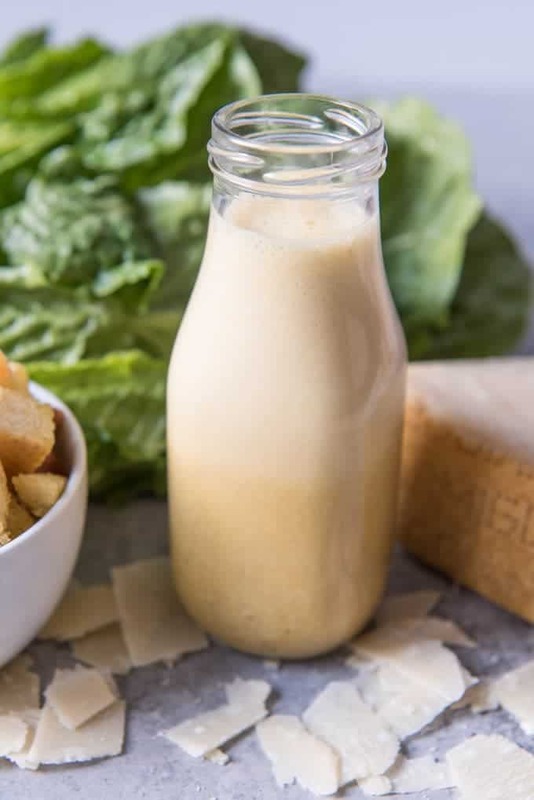 Homemade Caesar Salad Dressing makes a huge impact in this Classic Caesar Salad made with crisp romaine lettuce, crunchy croutons, nutty Parmesan, and of course, the original savory dressing that is so much better than the bottled kind you get at the store! The original caesar salad is a hugely popular item on many restaurant menus, and for good reason! 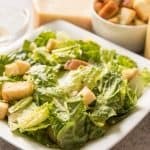 The fresh, crisp romaine lettuce and tangy, savory dressing with plenty of large, chunky croutons are a favorite of many. You can enjoy it as a side salad, or add a protein like grilled chicken for a complete dinner salad meal. 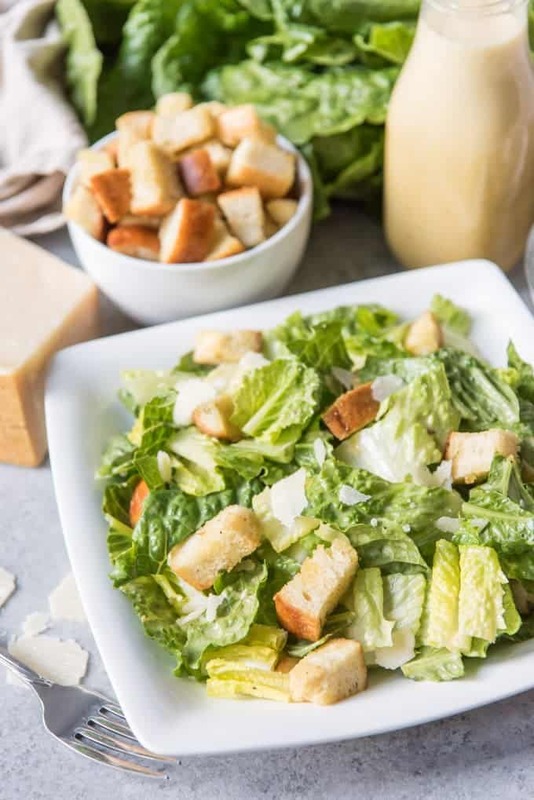 I wanted to share homemade caesar salad for this installment in our Historically Hungry series since I honestly had never tried making it at home before and usually just rely on bagged salad kits from the store. But making the garlicky, homemade caesar salad dressing and those crunchy, jumbo croutons is super easy. And the whole salad tastes so much better than the store-bought variety! Welcome to the Roaring 20’s edition of our Historically Hungry series! 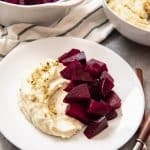 If you’re wondering what I’m talking about, the Historically Hungry series is where my friend Jenni, from The Gingered Whisk, and I highlight historical recipes that we feel deserve a second look by home cooks. They are old recipes made new and geared toward modern kitchens, modern lifestyles, and modern tastes. We choose a theme and era and each make a different recipe from that time period. Today I’m taking on a recipe made famous in Mexico thanks to Prohibition, Hollywood, and a San Diego restaurateur by the name of Caesar Cardini with a Homemade Caesar Salad Dressing, and Jenni’s got a Classic 1920’s Waldorf Salad for you! Although it WAS invented by an Italian immigrant to America, Caesar Salad does not come from Italy. 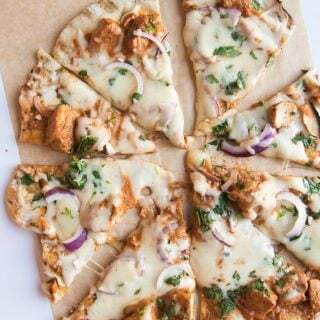 It was actually invented in Tijuana, Mexico in 1924 by chef Caesar Cardini, who was living in San Diego at the time. Or at least, that’s how one story goes. Cardini actually owned other restaurants in California before Prohibition hit, but once alcohol was banned, the savvy chef and restaurateur decided to open a new restaurant in Tijuana so that his regular clientele (mostly rich Americans and Hollywood celebrities like Clark Gable and Jean Harlow) could circumvent the no-alcohol restrictions of Prohibition. It was actually a booming business in Tijuana for restaurants in the 1920’s because of this! 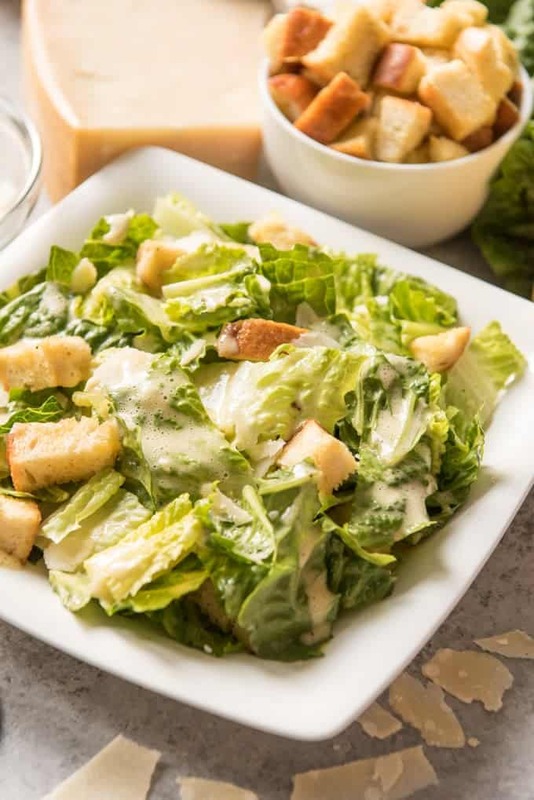 The legend is that the original caesar salad recipe was created on a busy July 4th weekend in 1924 when the kitchen was running short on supplies. Caesar himself actually prepared the salad table side for customers for added flair, and it was pretty much an instant hit, especially with the Hollywood elite, who spread it’s fame and popularity. 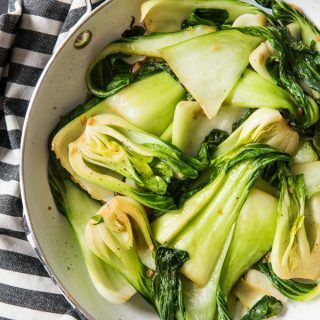 The original version used whole romaine lettuce leaves rather than chopped lettuce and was meant to be eaten by lifting the steam and eating the salad with your fingers! There is a little more to the story though, and it involves a lot more controvery, including the inclusion of anchovies in caesar salad dressing. Some sources say that Caesar’s brother, Alex, who opened and operated his own chain of restaurants in Mexico City, added anchovies to his brother’s recipe. Others say it was a different chef, Giacomo Junia from Chicago, who actually created the classic dressing and that he used anchovies. And then there is the claim that Caesar Cardini actually took credit for the famous dressing when it was really made by an 18-year old kitchen employee in Caesar’s restaurant named Livio Santini who had used his mother’s recipe that day in 1924. The history is murky and nobody seems to really know the answer. I even found an obituary in the L.A. Times from 2003 for Caesar Cardini’s daughter, Rosa, that went into surprising detail about this salad dressing and some of the controversy surrounding it! But that just makes the dish all the more interesting to me! Can you make caesar salad dressing without anchovies? Absolutely. I included them in this version because frankly, that’s how I like my caesar dressing! But I included a recipe note for the easy adjustment to make this without anchovies as well. Knowing how to make caesar salad dressing is the most involved part, really, but even that is super quick and easy. Like most salad dressings, homemade caesar salad dressing is made from an emulsified combination of oil, vinegar, and some seasonings. In this case, there is also a little garlic, lemon juice, mustard, Parmesan cheese, and yes, anchovies (although I’ve included notes for how to make this dressing without anchovies). 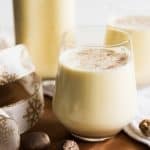 You don’t even need a blender or food processor to make this – it can all be whisked together by hand. What is a coddled egg? This recipe calls for a coddled egg. If you have never coddled an egg before, it’s just a gently and lightly cooked egg. Although some caesar salad dressing recipes use a raw egg, a coddled egg is gives the dressing a smoother, creamier texture, so it’s really worth the extra step. To coddle an egg, first bring the egg to room temperature so it doesn’t crack when you pour boiling water over it. While the egg warms up on the counter or in a bowl of warm water, bring a few cups of water to a boil and fill another bowl with ice water. Once the water is boiling, place the egg in a mug and pour the boiling water over it. 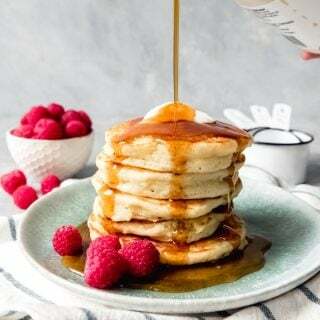 Set a timer for exactly one minute (if you let it go longer, the egg will cook too much and the white and yolk may be too firm), then immediately spoon out the egg once the timer goes off and gently transfer to the ice water bath, being careful not to break the shell. Let cool for about 2 minutes. Then just crack the coddled egg open and use it as directed in the recipe. Once you have made your own homemade croutons, the store-bought kind always seem sad and stale. 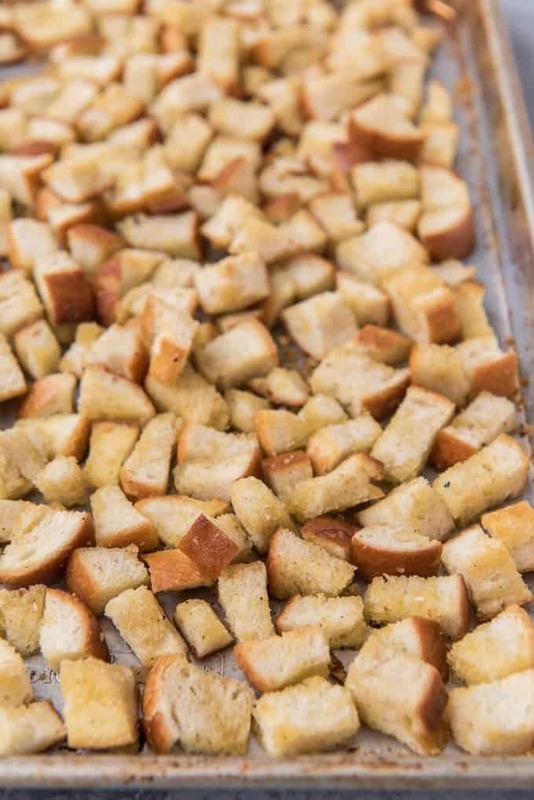 It’s super easy to make croutons at home, so as long as you are making caesar salad from scratch, I recommend making homemade croutons to go in it. 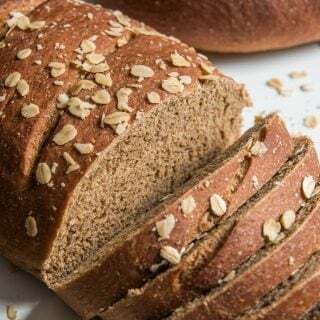 All it takes is 10 to 15 minutes to bake some day-old Italian or French bread that has been diced into 3/4-inch cubes and tossed with a clove of minced garlic and enough olive oil to coat, but not drench. Sprinkle the cubed bread lightly with salt and spread them on a baking sheet, then pop into a 375 degree F oven until golden brown. Halfway through the baking time, shaking the pan helps make sure the croutons toast evenly. 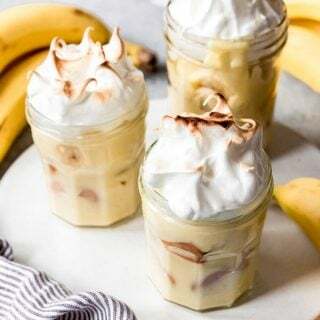 Don’t forget to sign up for the House of Nash Eats emails so you never miss another post like this one! 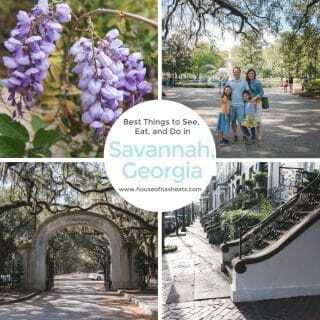 And if you enjoyed this post, you also might like my other Historically Hungry posts! 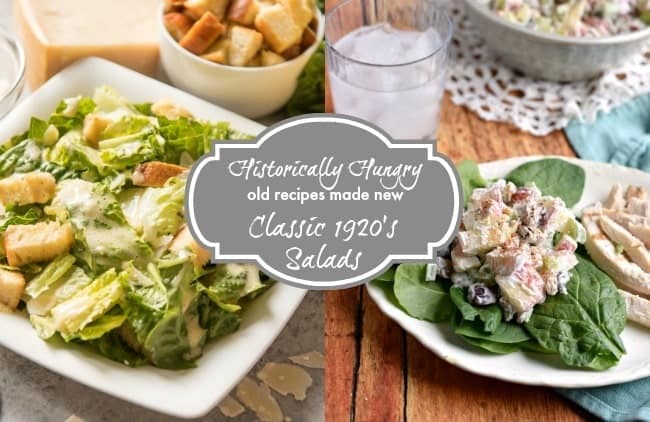 Be sure to check out Jenni’s Classic 1920’s Waldorf Salad as well! 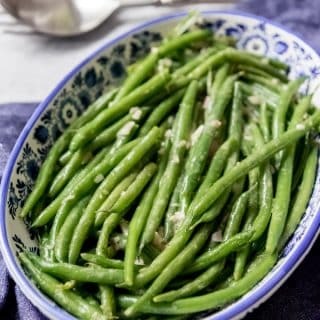 In a large bowl, combine the mashed garlic, anchovies, coddled eggs, lemon juice, mustard, Worcestershire sauce, pepper, salt, and vinegar until smooth. While whisking vigorously, slowly drizzle in the olive oil over at least 2 minutes to emulsify. When the dressing begins to thicken, whisk in the grated Parmesan cheese. Store any unused dressing in an glass jar with a tight fitting lid and use within 3 to 4 days. Wash and drain the lettuce, then pat it dry with paper towels to absorb any moisture. 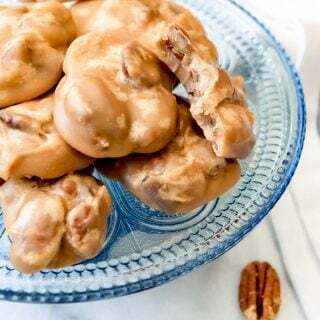 Cut or tear the leaves into bite-size pieces and refrigerate ahead of time so the leaves are chilled and crisp. 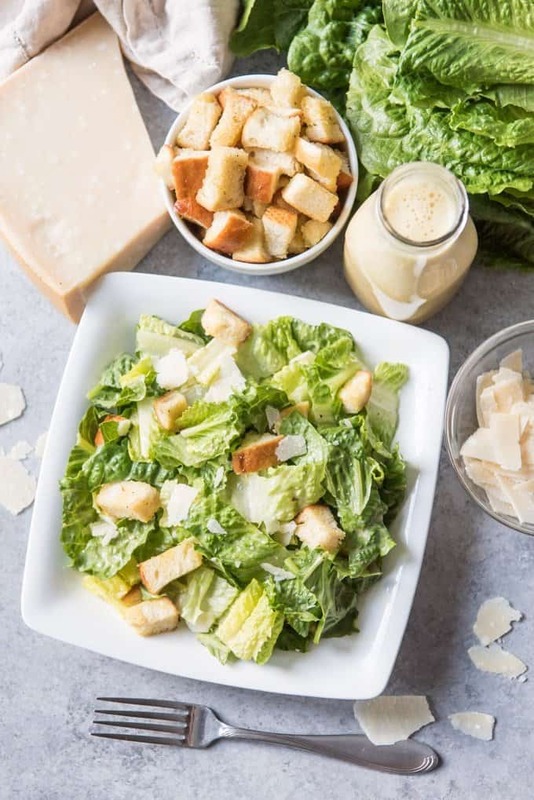 In a large salad bowl, add the romaine lettuce and 1/3 of the prepared Caesar Salad Dressing, tossing until well coated, and adding more dressing from there to taste. Add the shaved Parmesan cheese, croutons, and more freshly ground pepper, then lightly toss again and serve immediately! Preheat oven to 375 degrees. Dice the bread into 3/4-inch cubes. Toss the diced bread with the minced garlic and enough olive oil to coat, but not drench, each cube of bread. 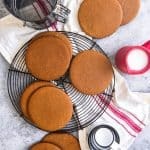 Sprinkle lightly with salt and spread out on a rimmed baking sheet. 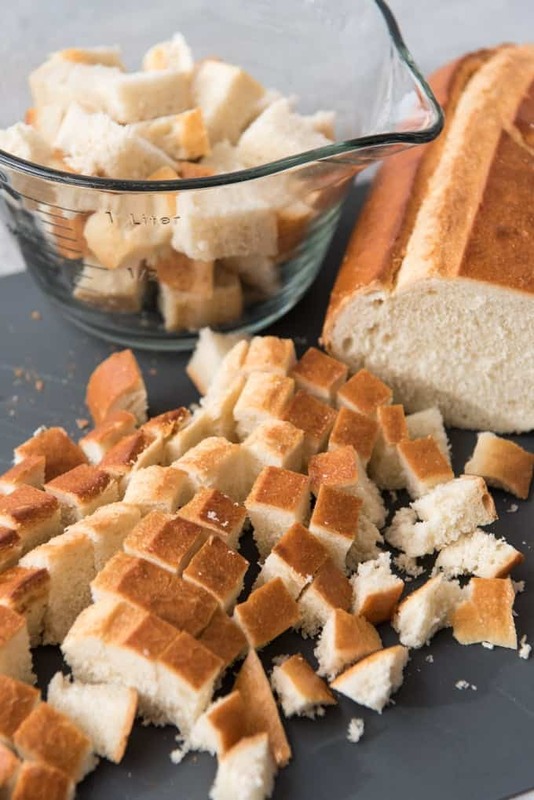 Bake for 10 to 15 minutes or until golden brown, shaking the pan halfway through baking to make sure the croutons toast evenly. Remove from oven and cool completely before adding to your caesar salad. If you want to leave out the anchovies, just increase the Worcestershire sauce to 1 1/2 tablespoons. This is my husband’s favorite salad! I need to try your recipe using a coddled egg! Homemade dressing is always better! And “YAY”! for anchovies!!! So many recipes I see don’t include them and it’s a “must” for Caesar dressing IMO!!! I just made your homemade Caesar salad dressing and it is WAY too tangy for our taste. Is there a way I can cut it to make it less tangy in the recipe I just made it do I have to start over? I don’t know of a way to make it less tangy once you’ve already made the dressing, but the ingredients that make it tangy are the vinegar, lemon juice, and anchovies. Next time you could cut back on some of those to see if you find a more mild version that is more to your liking. But for my taste, I love the strong flavor of a classic caesar dressing! Is there anyone who can tell me the yield? It’s about 1 1/4 to 1 1/2 cups of dressing.